The What: Matrox Video has launched the Matrox Monarch EDGE, a 4K/multi-HD, low-latency encoder for webcasting and remote integration (REMI) applications. The What Else: An H.264 encoder that can flourish in any workflow, Matrox Monarch EDGE is capable of delivering resolutions up to 3840x2160p60 or quad 1920x1080p60 for 4:2:2 10-bit, broadcast-quality video. This new encoder also offers flexible, future-proofed 3G/12G-SDI and SMPTE ST 2110 over 25GbE connectivity, plus versatile multi-protocol support including RTMP, SRT, MPEG-2, and RTSP. Monarch EDGE allows broadcasters to produce live, multi-camera sporting events, while minimizing on-site expenses by keeping talent in-studio. A compact, low-latency, low-power remote production encoder, Monarch EDGE delivers synchronized, secure remote camera feeds to a master control room or to the cloud for production. 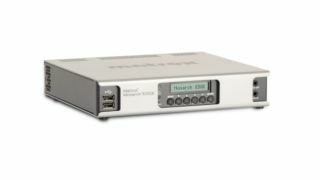 Programs destined for web or OTT delivery can use the Monarch EDGE 4:2:0 8-bit encoder model, while the 4:2:2 10-bit-capable encoder version is suited for demanding, broadcast-quality productions. The contribution- or mezzanine-level encoding capabilities of Monarch EDGE provide broadcasters with a means to add additional or complementary backhaul feeds, or redundant contribution channels to their primary feeds. This small-footprint appliance delivers four channels of 4:2:2 10-bit, broadcast-quality streams. Monarch EDGE also has enough encoding horsepower to generate simultaneous low-bitrate 4:2:0 proxy streams for each input, which can be monitored by any device on the network. The Bottom Line: With low-latency 4:2:2 10-bit video at up to UHD or quad HD, the Matrox Monarch EDGE is designed to enable video professionals, system integrators, and broadcasting organizations to address demanding requirements in new, emerging, and existing webcasting, REMI, and high-density contribution workflows.